NoSQL injection is one of the most common vulnerabilities I find in Meteor applications. I’m even starting to notice NoSQL injection vulnerabilities in other stacks and frameworks as well, like vanilla Node.js applications, and even Phoenix/Elixir applications. I’ve written a short one page, five minute introduction to NoSQL injection for applications using MongoDB. My goal is to give you a quick primer on what the vulnerability looks like and how to fix it. That way, you’ll be able to identify it and seal up the vulnerability in your own applications. I’m giving out a PDF version of the introduction to everyone who signs up for my newsletter. To sign up, enter your first name and email address below and hit subscribe! 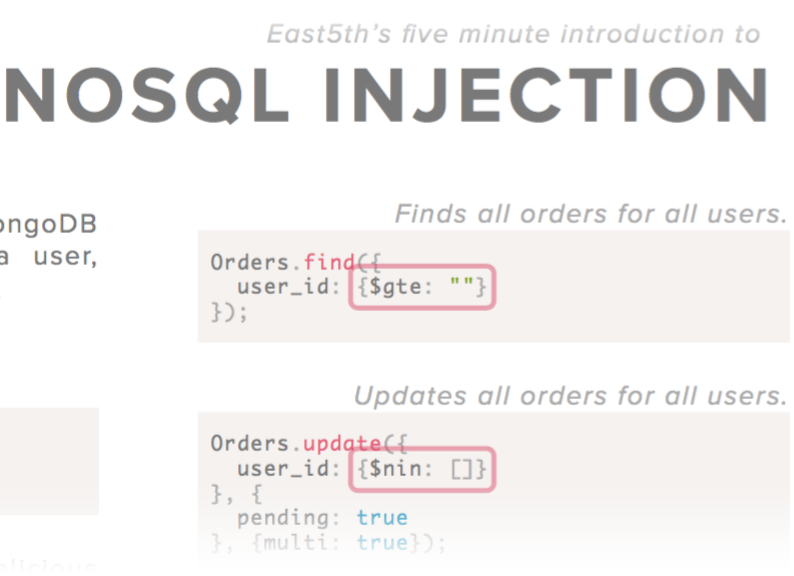 Along with the NoSQL injection primer, you’ll receive weekly updates on all East5th articles and projects. Each newsletter also has a small selection of links and resources that I’ve found helpful when building secure, robust, maintainable software. After you’ve signed up and read the NoSQL introduction, respond to the email and let me know if there’s any way I can help you build better software! This article was published on October 24, 2016 under the MongoDBNoSQL InjectionSecurity tags. For more articles, visit the archives. Also check out the work I do, and reach out if you’re interested in working together. Phoenix Todos - Adding Lists and Tasks – Part eight of our 'Phoenix Todos' Literate Commits series. Building out support for adding todo lists and tasks to those lists. Phoenix Todos - Updating and Deleting – Part nine of our 'Phoenix Todos' Literate Commits series. Updating and deleting items in our todo list.